Drowning is the second-leading cause of unintentional injury-related death for children ages one to 14. 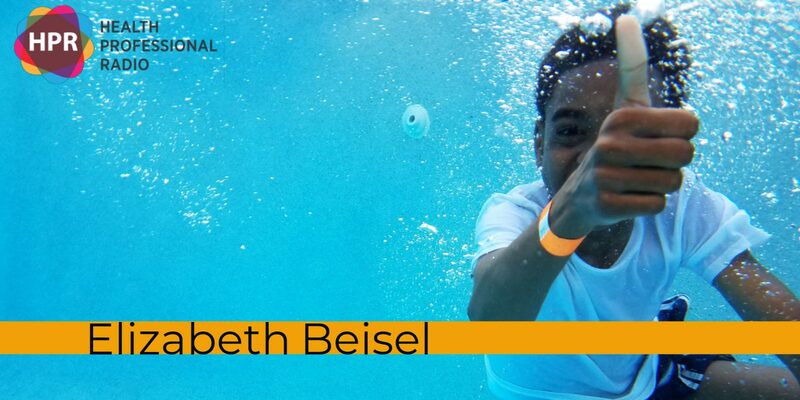 Elizabeth Beisel, National Learn to Swim Day’s spokesperson, talks about the benefits of learning to swim at an early age. National Learn to Swim Day is founded by Swimways in 2012 to raise awareness about water safety and the importance of teaching children to swim, especially now that summer is just right around the corner. To know more about the National Learn to Swim Day, visit TeachMeToSwim.com or SwimWays.com. Elizabeth is a Two-Time Olympic Medalist, USA Swimming Foundation Ambassador, and National Learn to Swim Spokesperson. She is a Backstroke and Individual Medley specialist with nine major international medals to her credit. She made her first National Team by age 13, and at 15 she was the youngest member of the 2008 U.S. Olympic swim team. At the 2012 Games in London she won silver in the 400-meter Individual Medley and bronze in the 200-meter Backstroke. Neal Howard: Hello and welcome to the program. I’m your host, Neal Howard here on Health Professional Radio. Glad that you could take the time to join us. Our guest today is Elizabeth Beisel. She’s two-time Olympic medalist USA Swimming Foundation Ambassador and National Learn to Swim Spokesperson and she’s joining us on the program today to talk about National Learn to Swim Day, the Wakefield research national survey and the benefits of learning to swim at an early age. Welcome to the program, Elizabeth. Thank you for taking the time. Elizabeth Beisel: Thank you so much for having me. N: Great. Now, I told our listeners a little bit about who you are, winning Olympic medals a couple of times, Swimming Foundation Ambassador. Give us a brief background and tell us what National Learn to Swim Day is. E: I was born and raised in Rhode Island, so it’s pretty exposed to the water – to the ocean sea. So I learned how to swim when I was just six months old and that turned into a love for the sport and I’ve been to three Olympics since and now I’m here promoting National Learn to Swim Day on behalf of SwimWays and the USA Swimming Foundation. And so what a better time of year? There is no better time of year to promote this day especially with summer right around the corner and it is a day to promote and bring awareness to the importance of learning how to swim because it is such a critical life-saving skill that we all need to have no matter what age you are. N: Now, you mentioned having a love for swimming after growing up around the water and the benefits. One of the benefits of learning to swim at an early age being possibly a life-saving benefit. Talk about some of the other benefits of learning to swim at an early age. E: It’s amazing what swimming can give you. It is definitely more than just a life-saving skill. Studies show that children that learn how to swim before the age of five have better cognitive functions, motor skills, mathematical skills. They are statistically higher IQs than the normal child that doesn’t swim. So aside from it being that life-saving skill, it also gives you so many other skills that you would develop much faster than normal children who wouldn’t have those swimming abilities. N: As a spokesperson for the National Learn to Swim initiative, there were some questions asked on a specific survey I believe the Swimways survey. Could you talk a bit about the survey and maybe some of the results? E: Absolutely. So that survey shows that parents actually aren’t aware, 17% of parents aren’t aware that children have those developmental functions coming in faster if they learn how to swim and if a child comes through a household where his or her parents have little swimming ability, they are 70% less likely to learn how to swim themselves and that’s a staggering number. So right now, for all the parents listening, I encourage you, I urge you to get yourself in a pool as well with your child because that’s going to make you feel safer and as well as your child feel safer. N: So that being said, the benefits being many there are a lot of ways to learn to swim. I won’t mention how I learned because it’s probably not a great way to start. But what should parents consider when considering lessons or teaching their kids to swim to get some of those benefits? E: So if you visit usaswimmingfoundation.org, you can actually type in your zip code and where you live and they will provide you with a local swim lesson provider. And they do not allow more than six children per instructor so you will feel safe about your child being in the water with one person and there’s a lot of one-on-one time and it’s a great way for you to get started and to find a local YMCA or Boys and Girls Club that will provide you with those fun lessons. N: As parents we recognize the benefits of learning to swim at an early age but what if the kids aren’t necessarily that interested in getting in the water and learning to swim? How do you get them interested? What are some tips that we can use to get them pointed in that direction? E: Swimways actually have a swim step system and pretty much pairs training aids with the ability of your swimmer. So it makes it fun for kids. You’ll have like the sticks and the floaties and all those fun things and so that allows them to feel a little bit more comfortable because they’re having fun but they are still learning that life-saving skill of swimming. So swimaways.com has all of those tools and training aids that you can purchase that will help make it a little bit more fun and it will take away that fear factor of being in the water or maybe getting closer to the deep end because ultimately swimming is about having fun. It’s such a social sport and activity and especially with summer right around the corner, there is no better time to get your children and yourselves safer and more comfortable around the water. N: Now, is this the first National Swim Day? A lot of folks know how to swim but maybe not a lot of folks have heard about a day dedicated to getting the word out about the benefits of learning to swim early. E: Right. So this is actually the 7th National Learn to Swim Day. It’s the 2nd year that USA Swimming Foundation has partnered with Swimways and that really hits close to home for me because USA Swimming Foundation is really close to my heart. Their mission is to save lives and build champions. And together doing that with Swimways which also their mission is to save lives and promote water safety, it’s just such a great partnership that we have going on and I’m honored to be working on behalf of both of them to promote this important day. National Learn to Swim Day should be every single day of the year. You don’t need a day to learn how to swim but we are hoping not having this day once a year right before the summer season hits. It’s a way to really encourage people to get safer around the water and take that next step of actually going to a pool and getting yourself enrolled in swim lessons. N: Well, we’d like to learn some more online where can we go? E: You can go to usaswimmingfoundation.org and swimways.com. Visit both of those sites and they will give you everything that you need to know about getting your child or yourself started to be safer in the water. N: Thank You, Elizabeth Beisel and congratulations on your winnings and also on getting the word out in such a great way on National Learn How to Swim Day. E: Thank you so much for having me. N: You’ve been listening to Health Professional Radio. I’m your host, Neal Howard. Transcripts and audio of this program are available at healthprofessionalradio.com.au and also at hpr.fm. You can subscribe to this podcast on iTunes, listen in and be sure to visit our affiliates page at hpr.fm and healthprofessionalradio.com.au.